Citation: C N Trueman "The Personal Computer"
Personal computers are now a very common item in many houses yet in 1955, there were only 250 computers in use throughout the world. In 1980, more than one million personal computers had been sold and by the mid-1980’s, this figure had risen to 30 million. How did this come about? A computer in 1955 was very large and could not have fitted into a normal room in a normal sized house. They frequently burned out and had a tendency to attract moths into the system which short-circuited them. (Getting a computer ‘bug’ now refers back to the time when moths were a problem to the early computers). In the late 1950’s, computers got smaller because one of its main components – the valve – was replaced by the much smaller transistor. These made computers far more reliable and therefore businesses took a much greater interest in them. Firms such as IBM could sell a mainframe computer for just under £½ million pounds in today’s money. By the mid-1960’s, the microchip was replacing the transistor. A microchip could have several transistors on it. But being smaller, it lead again to a decrease in the size of computers. By 1965, there were 20,000 computers in the world. The most famous was the IBM System/360. The microchip also lead to computers being made that were small enough to get into the average sized room in a house. By 1970, one microchip could contain 1000 transistors on it. In 1970, a home personal computer would have cost nearly £70,000 in today’s money. In 1971, the microprocessor went on sale. Developed by Ted Hoff of Intel, the Intel 4004 was to revolutionise home computing. The 4004 cost just over £3000 in today’s money but by 1972, Intel had produced the 8008 which was far more powerful that the 4004 but cost a tenth of the price of the 4004. Microprocessors had a multitude of uses but they could be used at the heart of true personal computers. In the early 1970’s personal computers were used only by hobbyists. The first ‘hobby’ personal computer was the Altair 8800 which cost just under £900 in today’s money. It had the same power as a computer of the 1950’s that cost $1 million. In 1975, Bill Gates and Paul Allen developed a program for the Altair that allowed people to write their own programs in BASIC program language. 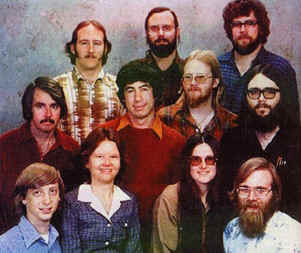 Their newly formed company was called Micro-Soft which was later changed to Microsoft. In 1975, Apple Computers was founded by Steve Jobs and Steve Wozniac. Apple created the “home/personal computer” that could be used by anybody. The computer – Apple II – was launched in 1977 and was an immediate success. The personal computer was sealed in a neat plastic case, it had a keyboard, video unit and used removable floppy discs. Above all, it only cost £2400 in today’s money. The success of Apple II established Apple Computers as the main player in the field of personal computers. By 1980, there were 1 million personal computers in the world. The personal computer moved into the world of business when Dan Bricklin created a spreadsheet program. His program – called VisiCalc – was designed for the Apple II. It went on sale in 1979 and within 4 years it had sold 700,000 copies at $250 a time. IBM launched its own personal computer in 1981. Eventually 85% of all personal computers were to be IBM compatible. Microsoft won the contract to write the operating system for the IBM personal computer. Microsoft called its new operating system MS-DOS. Each copy earned the company $10. During the 1980’s, MS-DOS was installed in over 30 million personal computers.